The LUCIE leather zippered wallet is small but mighty and perfect for your daily essentials. It opens to three credit card slots with extra room for cash, change, a lipgloss and can also fit an iPhone in a slim case (does not fit the largest iPhone). 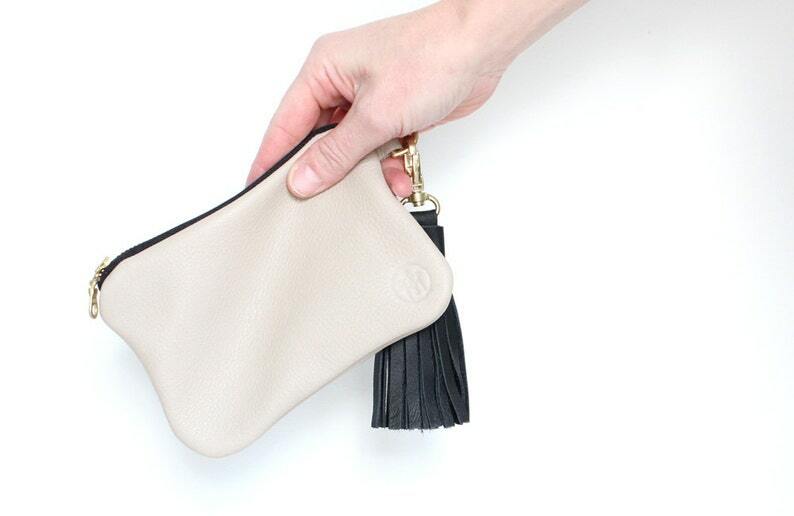 Detachable black leather tassel. This listing is for the CREME leather wallet. This wallet is also available in Slate Blue and Dark Brown. All leather at Sans Map is carefully hand selected and sourced from industry remnants or thoughtfully repurposed from leather garments. Original stitching and seams and natural leather imperfections lend to the unique quality of Sans Map bags, no two are exactly alike. By incorporating reclaimed fabrics into my designs and utilizing existing textiles, the need to consume raw materials is greatly reduced. This item is a made to order item. Please allow 5-7 days for your item to be made and prepared for shipping.